Swedish whisky ambassador Magnus Fagerström considers himself a ‘former collector’, particularly of old BenRiachs. These days he feels more inclined to open bottles than hang onto them, he tells Angus MacRaild. The chances are that you’ll have heard of or seen Magnus Fagerström before you’ve actually met him. A ubiquitous presence online and at whisky festivals around Europe, he makes for a familiar and jovial face in the whisky world. Formerly an employee of Swedish drinks importer Symposium, and now a freelance whisky educator and ambassador, Fagerström is one of a long line of whisky people who have found themselves eventually making a living from their passion. Over two decades later there are few people who better represent today’s buoyant whisky scene in Sweden than Fagerström. 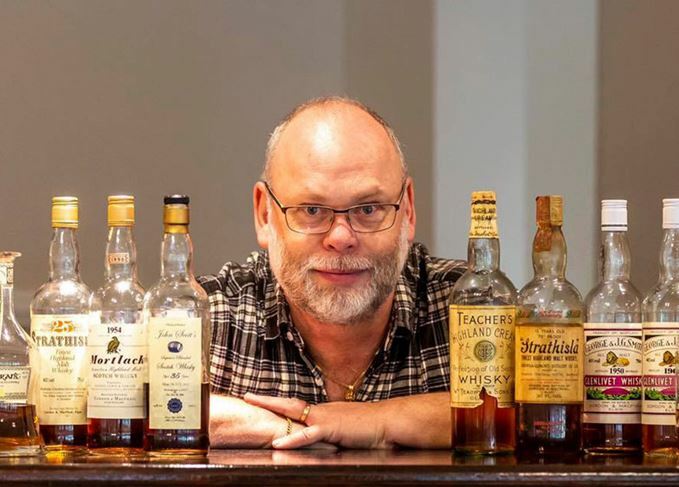 A regular exhibitor at festivals and host of some remarkable rare whisky tastings, he has made a name for himself as one of the country’s most prominent enthusiasts and experts. From his perspective he sees a dynamic and expanding whisky culture in his home country, one underpinned and supported by the burgeoning distilling scene that has arisen there over the past couple of decades. ‘I think it is still growing,’ he reflects. ‘We have a lot of fairs in Sweden today, a bit too many actually from the exhibitor’s perspective. The crowds at the fair are good and we see new people coming into the whisky world all the time. ‘I do think that the Swedish distilleries have played a big part in this growing interest. Most of them sell small casks to customers and people find it fun to own their own cask. It only takes four or five years in a 30-40-litre cask before you have your own whisky.’ An owner of several casks himself, he sees this ability for people to gain a sense of ownership and participation in the creation of new whisky as a key allure to bringing new people into whisky. It’s a sentiment that affirms his position as very much a drinker of whisky rather than just an accumulator of bottles. Indeed, he still opens many bottles over the course of a year, even many of which are now eye-wateringly expensive. For him though, he was fortunate enough to buy many of these bottles when they were affordable and would rather open them than sell them. Perhaps what most emphasises Fagerström’s depth of experience with whiskies is how he struggles to come up with a single event or occasion for his most treasured whisky experience. He says: ‘The best whisky experiences are when you enjoy whisky with friends.’ A sentiment which might seem a tad vague, but it’s understandable when you have to choose between such occasions as a line-up of 100 BenRiachs, opening a 1907 Usher’s next to a 50-year-old Mortlach from 1936 (one of his all-time great whiskies), and any number of other talked-about and impressive tasting events. Travellers to Heathrow will have the chance to buy the new single cask single malt whisky. Whisky fans sailed the Baltic Sea last week to discover some exclusive gems onboard the Cinderella. A single marsala hogshead laid down in 1998 has been bottled to celebrate the occasion. The Swedish collector turned her hobby into a career, and now runs a whisky bar in Bredaryd.